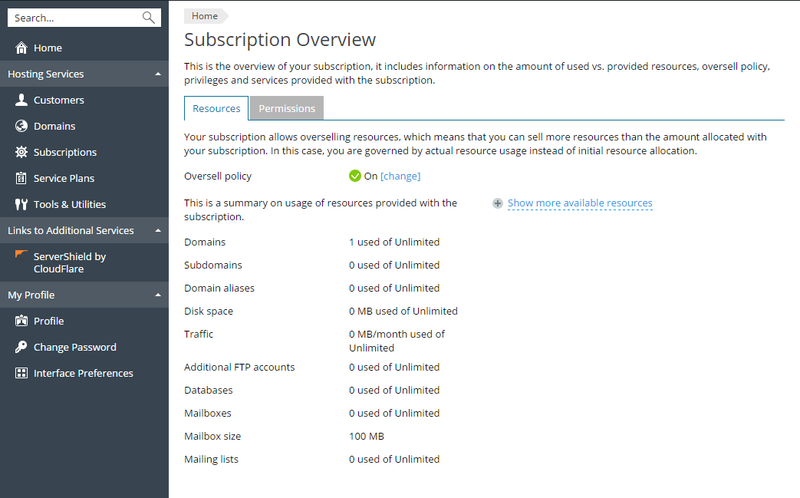 This section lists Plesk resources included in reseller subscriptions. To view the resources allotted for your account, go to Home > My resources and permissions overview. Defines if you can sell more resources than allocated to you with the plan. If overselling is allowed, you are governed by actual resource usage instead of initial resource allocation. If overselling is prohibited, you can create only the number of service subscriptions limited to the total amount of disk space or traffic provided to you with your plan. Overselling is a marketing strategy based on the following scheme: a reseller, who was allotted, for example, ten gigabytes of disk space, allocates five gigabytes of disk space for each of their customers, assuming that none of them will actually use all of their allocated disk space. The total number of subscriptions that you can create for your customers and for your own purposes. The total number of subdomains that can be hosted within the subscription. The total number of additional alternative domain names that can be used for websites within the reseller subscription. The total amount of disk space that can be used by your own websites and sites of your customers. It includes disk space occupied by all files related to your reseller subscription: contents of websites, databases, applications, mailboxes, log files and backup files. The amount of data that can be transferred from the subscription's websites and FTP/Samba shares during a month. The maximum number of FTP accounts used to access the files and folders hosted with a subscription. The total number of databases that can be created on the Plesk database servers and used by the subscription's websites. The maximum number of MySQL and Microsoft SQL Server databases respectively that can be created on the database servers registered in the Plesk and used by websites hosted with the subscription. The maximum total amount of disk space (in megabytes) that the MySQL and Microsoft SQL Server databases respectively can occupy. The total number of mailboxes that can be hosted within the subscription. The maximum amount of disk space that can be allocated to a mailbox for storing email messages and auto-reply attachment files. You will not be able to specify the bigger mailbox size in your service plans. The total number of mailing lists that can be hosted with the subscription. The maximum number of customer accounts that you can create and serve. The total number of personal web pages that can be hosted on the websites within subscription. This service is mostly used in educational institutions that host non-commercial personal pages of their students and staff. These pages usually have addresses like http://example.com/~webuser. The total number of websites that can be created, published, and then edited with Presence Builder. The total number of dedicated IIS application pools that can be allocated for websites created within the reseller subscription. The total number of ODBC connections that can be used within the subscription.